This rockin’ teenage combo is The Brown Act, coming soon as chefs and featured minstrels to the top Forest Fund bidder. The boy-band trio may even perform selections from their unreleased new album, "Closed Session." Left to right, Patrick Cleary, Clif Clendenen and Mark Lovelace. ARCATA – For those who attended Bat N’ Rouge (a fundraising event with proceeds designated to the Arcata Ridge Trail Project on Sept. 10 you know that the Arcata Ball Park will NEVER EVER be the same! Community Notables and Politicos, Pom Pom Queens, Sisters of Perpetual Indulgence, Humboldt Roller Derby Players, Good Relations Girls, Humboldt Pride Band, and unlikely seniors and business folks dressed in DRAG, all uniting for one night of fun and frolic. Together we raised over $17,500 for the Arcata Ridge Trail Project and would like to up the community donation to $20,000! But how do we do that after the party is over? During Bat N’ Rouge, we held a live auction and because of time constraints, we couldn’t get to some of the fabulous prizes offered by generous members of our own community. Enjoy a tattoo from Arcata Artist Dean Shubert, or how about a trip for you and seven friends through the ancient Headwaters Forest guided by Greg including a special acoustic music concert by renowned singer-songwriter Joanne Rand, or how cool would it be to host a dinner party for and house concert for seven of your friends by supervisors Mark Lovelace and Clif Clendenen and candidate Patrick Cleary (I’ve heard that they even do dishes)! Don’t miss your opportunity to participate in this one time “Blind Print Auction” with proceeds designated to the Arcata Ridge Trail Project. Here’s how: e-mail your “blind-bid” and contact information to news@arcataeye.com with the subject line “Ridge Trail” by Friday, Oct. 1, 2010 at 9 a.m.
• Dean Schubert from Visual Tattoo will work with you to create a one-of-a-kind tattoo valued at $200. • Guided hike in the Headwaters Forest Reserve, led by Greg King with an acoustic concert in the forest by Joanne Rand. Minimum Bid: $400. Greg King discovered and named the Headwaters Forest, and brought it to national attention. Greg was one of the original leaders of the effort to protect this last and largest privately-owned grove of ancient redwoods, and helped to preserve this magnificent forest for future generations. As a guide, Greg brings a personal knowledge and history of the forest that simply can’t be found in any guidebook! For this hike, you and up to seven friends will be joined by Greg’s wife, renowned singer-songwriter Joanne Rand, who will serenade your group with an acoustic performance of her heartfelt original acoustic music. • Third District Supervisor Mark Lovelace, Second District Supervisor Clif Clendenen and Fifth District candidate Patrick Cleary will prepare dinner in your home for you and up to seven guests, featuring locally-grown foods, local beer and wine and a sumptuous dessert by pastry chef Laurie Clendenen. Following dinner, you and your guests will be treated to a private house concert by acoustic trio “The Brown Act,” featuring Mark Lovelace on guitar, Clif Clendenen on mandolin and Patrick Cleary on anything with strings. 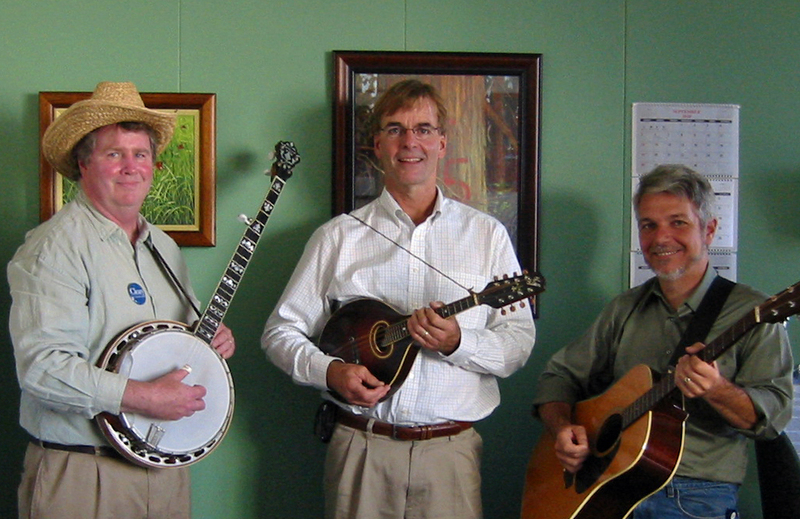 The Brown Act will play a selection of folk, bluegrass and maybe even some original tunes! And they’ll do the dishes, too! This offer is not available in stores and will not be repeated! (Eight people maximum for dinner; up to 20 for dessert and music. Arrangements must be made in advance.) Minimum bid: $350. This entry was posted on Tuesday, September 28th, 2010 at 5:51 pm	and is filed under News, Environment. You can follow any responses to this entry through the RSS 2.0 feed.